MPV Pneumatic Control Valves allow for direct remote control of individual brake friction modules simultaneously through a singular unit. Brake friction modules can be turned on or off from the MPV to set brakes to run at varying torques based on the needs of the material you are running. Heavy Duty design ensures the MPV withstands the harshest environments never sacrificing performance. Remote Operation allows adjustments to be made to the brake without having to work on the brake directly. For additional information on the MPV Heavy Duty Push Valve please download the MPV Datasheet. 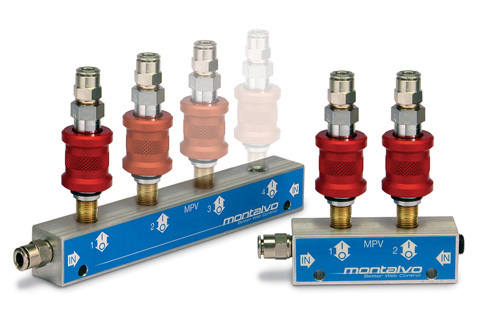 Montalvo’s MPV-2 Heavy Duty Push Valve features 1-2 Air Outputs to remotely control individual brake friction modules. For additional information on the MPV-2 please refer to the MPV Datasheet. 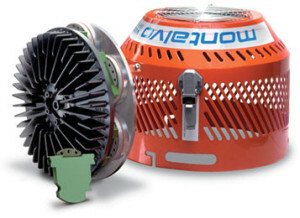 Montalvo’s MPV-4 Heavy Duty Push Valve features 3-4 Air Outputs to remotely control individual brake friction modules. For additional information on the MPV-4 please refer to the MPV Datasheet.